The Alliance Cinema was a small single screen theater that seemed like a screening room. They showed independent films and the occasional revival. I last remember it being open in 2000. There seemed to be no advertising or even much of a sign for the Alliance Cinema. Walking into it seemed like walking into an office. It was located on the Lincoln Road Mall and the entrance was not on the walk like the other stores but rather you had to walk around to enter it. If anyone else can remember some facts on this please feel free to add them, since I can’t remember that much. I do know that after Regal opened it’s monster South Beach 18 right across from it just about it didn’t last much longer. The Alliance operated from 1991 to 2000. I was the last Executive Director of the Alliance Cinema until 2000. The Cinema had become a true community center bringing independent cinema fans from all over South Florida who would make the trip no matter what we were showing. We would ask them if they wanted to enjoy the local restaurants etc. and they would usually say, no, we want to see the film. The Cinema also became a center for the GLBT community. 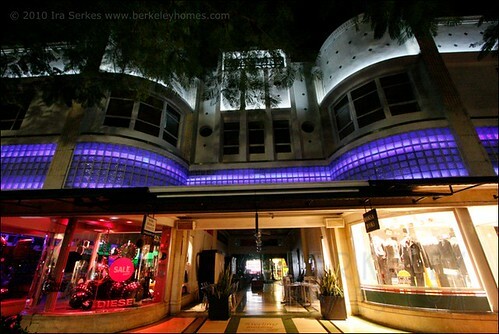 In 1990, when the Cinema opened, it was the first cultural venue to offer any GLBT programming in the area. This was at least two decades behind New York, San Francisco, and Chicago, but it was a huge contribution to South Florida. The Alliance Cinema participated in many GLBT issues in its time and provided a central hub for information for newcomers to town. When we closed in 2000, we also were running a film school called IFP which was a local chapter of the national organization IFP National, of which we were a founding member. This school had formerly been called the Alliance Film/Video Co-op. When I left, we had about 150 filmmaker members, and had just completed the State of Florida Feature Film Competition in which a feature filmmaker won $25,000 in cash and over $100,000 in goods and services to make a feature film. When I left, I turned over some treasures from the Alliance Cinema to Helen Kohen who was working on an Arts Archive through the Miami-Dade County Library System so that this much loved organization would live on in the history of the arts of Miami-Dade County. The Alliance was where the Miami Beach branch of Books & Books is now. The restrooms for the bookstore were the restrooms for the Alliance. Other than that I don’t recognize anything inside the space from the former cinema. The Alliance was always a one screen (unless they somehow added a second in the months between when I was last there and when they closed, though I don’t think they had the space for it). There was no marquee, though they may have put a small portable sign that could be taken in at closing time out on the pedestrian way with what was playing and directing people down the corridor to the theater if I remember correctly. “Missing the Big Picture” from June 17th, 1999. “Reeling in the Year” from January 4th, 2001. The photo is of whom I remember as the Alliance projectionist at the time. Joanne Butcher is mentioned in the articles, and here on Cinema Treasures she gives her own take in her comment above from December 20th, 2008. In 2016, Miami is served by several art cinemas, most of which did not exist at the time the New Times articles were written. The Alliance was at the end of the hallway pictured here. The clothing store on the left of the hallway was the original location of the Miami Beach branch of Books & Books which has since moved down the hall into the former Alliance Cinema space.